Bath & Body Works 3-wick candles are extremely popular, especially their seasonal candles which offer delicious fall and winter smells. 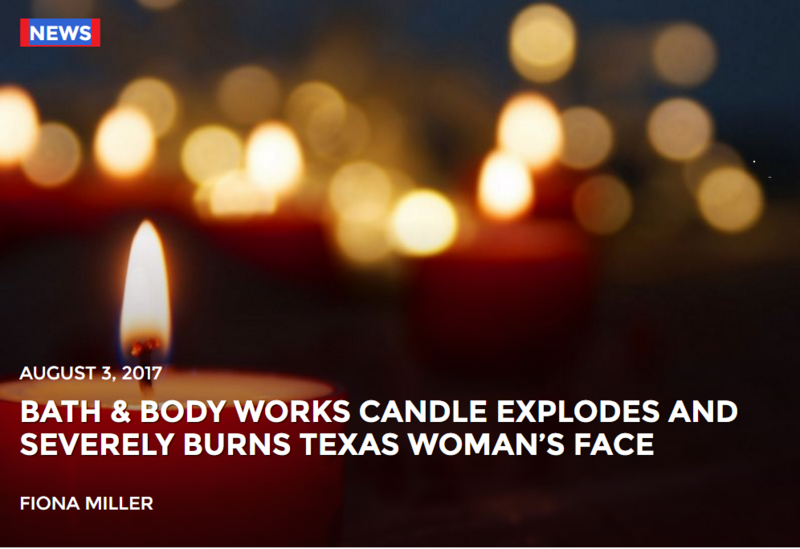 However, one Texas woman suffered a nightmare after one of her favorite candles exploded, giving her first and second-degree burns on her face. The mother of one lit the candle in her living room and took her two-year-old with her to the bathroom so she could dye her hair. While doing so, she smelled something funny and went back into the living room to see what was going on. Ashley Brawley came back to find that a flame from the candle was burning six inches above the glass container. When she tried to blow it out, instead of extinguishing, it blew up in her face, causing what she describes as a fireball and hot wax to splash onto her body. She immediately ran to the bathroom to try and help relieve the burns with water and aloe vera, but eventually had to go to the hospital in order to heal the burns. Her husband, Cody Brawley, had to grab oven mitts and threw the candle outside where he hosed it down. After doing so, he claims the glass jar the candle is held in burst into pieces. Her husband posted a video of the accident on his Facebook page to help make people aware of the dangerous nature of the candles, and it has been viewed over 2 million times. Although Ashley Brawley is expected to make a full recovery, several people on Facebook expressed similar concerns with the candles. Many stated that they had candles explode in their homes as well. They had been badly burned or come very close with the Bath & Body Works candles and has opted never to purchase them again due to safety concerns. Bath & Body Works, however, insists that the candles are safe and up to regulation standards. They gave Ashley a $25 gift card so that she could repurchase the candle if she wants to, although it seems unlikely she will be buying a candle from the company again. The pair is sharing their story in an effort to highlight the dangers of the popular candles.